● Hose sizes are measured by their Internal Diameter, ID, and NOT the Outside Diameter. ● All hose assemblies are leak tested with 100% nitrogen. ● Hoses remain flexible in cold weather, unlike many others. ● 100% ANSI Z21.54 CSA-certified hose connectors, engineered/manufactured to the highest specifications in the industry. ● Only UL-certified steel is used in the inner core. ● Domestic CA360 brass is used on the milled-end fittings. This is in order to exceed all CSA connector certifications. ● These fittings and hoses are compatible with Gas Flo quick disconnect fittings, and also the popular Hansen and Sturgis quick disconnect fittings. They are not compatible with any Snap Tite products. ● Optional Stainless Steel overbraid adds great strength and protection to the gas hose, often desired for commercial use. It also makes the gas hose almost rodent-proof. Hose sizes are NOT measured by the outside diameter of the hose. 100PB484 - Strip wound hose 3/8"ID, with 3/8" CSN (M) plug x 3/8" (F) SAE (gas flare) swivel fitting. 5 psi max. This natural gas hose can also be used with low pressure propane. Other custom made lengths available upon request. Requires an optional female socket below. Remember that hose sizes are NOT measured by the outside diameter of the hose. For Custom length 3/8"ID low pressure (natural gas or propane) hoses call. 713.222.0077. 6 ft. 1 # 10 oz. 10 ft. 2 # 13 oz. 12 ft. 2 # 14 oz. 15 ft. 3 # 11 oz. 100PB462 - Strip wound hose 3/8"ID, with stainless steel overbraid and high temperature poly-jacketing, with 3/8" (M) plug x 3/8" (F) SAE (gas flare) swivel fitting. 5 psi max. This natural gas hose can also be used with low pressure propane. This is the highest quality low pressure gas hose available. Other custom made lengths available upon request. 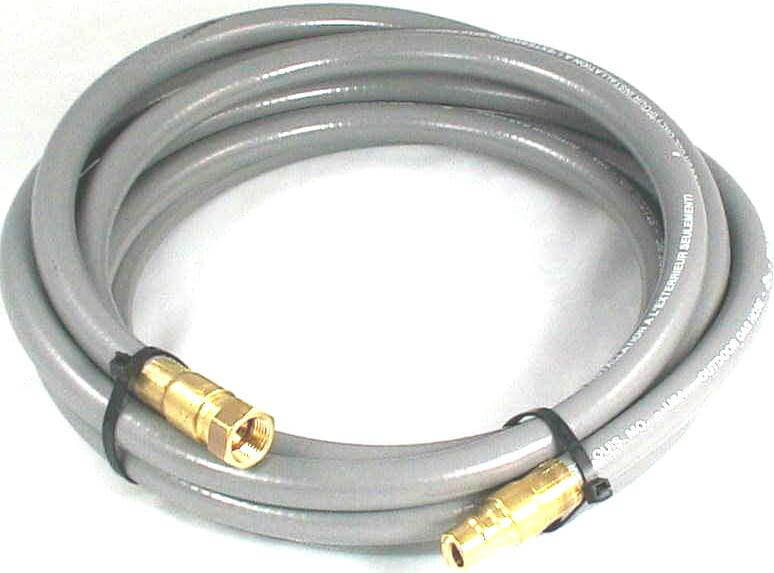 Stainless Steel overbraid makes this gas hose almost squirrel-proof. Requires an optional female socket below. Remember that hose sizes are NOT measured by the outside diameter of the hose. 104PC001 - Model 375 CSN 3/8"ID quick disconnect female Socket x 3/8" (F) NPT. 0.5 psi max. Can also be used with low pressure propane. Wt. 6 oz. Free shipping within the 48 contiguous U.S. States. 104PC007 - Model 375 CSN 3/8"ID female disconnect Socket x 3/8" (F) NPT, includes 3/375 integral ball valve and a thermal shut off x 3/8" (F) NPT. 25 psi max. Wt. 8.2 oz. Free shipping with in the 48 contiguous U.S. States. 375QDDP - Dust Plug for 3/8"ID Model 375 quick disconnect female sockets. The outside diameter of the dust plug insert is approx 1/2". Colors of the dust plug may vary. If you are purchasing the QD female socket listed above, there is no need to purchase an additional dust plug. One is already included with the brass female socket and will be shipped with the order. These dust plugs will NOT fit any Quick Disconnects on RVs. Wt. 1.2 oz. Free shipping within the 48 contiguous U.S. States. 375QDDC - Dust Cap for 3/8"ID Model 375 quick disconnect male plugs. The outside diameter of the dust cap cover is approx 1/2". Colors of the dust cap cover may vary. If you are purchasing a QD male plug fitting listed above, there is no need to purchase an additional dust cap cover since one is already included with the brass male plug. It will be shipped with the order. These dust caps will NOT fit any Quick Disconnects on RVs. 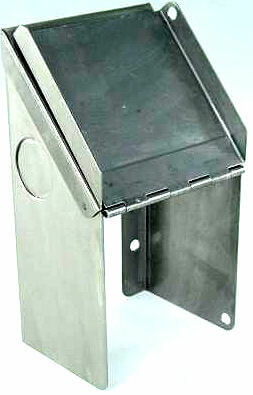 Install a 3/8"ID Ball Valve Socket (104007) facing down and then screw this cover box over it. Flip the lid up to access the ball valve and socket. Hole drilled at right side of cover opening to permit use of a small safety lock. Installation is simple. Purchase the #104007 Ball Valve Socket separately. 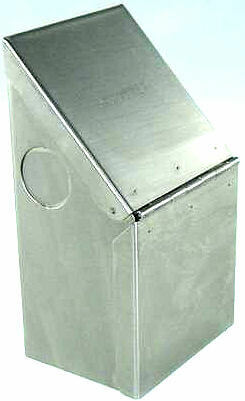 a 1/2" high domed lid when powering an outdoor appliance. High temperature shut-off device, 3/8" thick cast aluminum, CSA Certified, Approved for Indoors & Outdoors, Low Pressure Propane or Natural Gas. 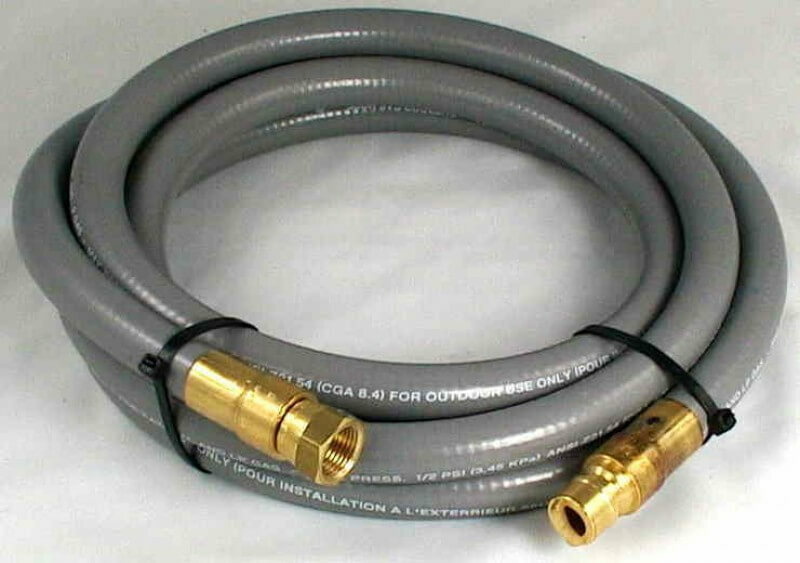 It includes (2) 3/8" thick cast aluminum lids, 3/8" Quick Disconnect Female Ball Valve Socket, and a 3/8" ID Stainless Steel Overbraid Hose (8ft long) with one side of the hose 3/8" Male Quick Disconnect Plug and the other side 3/8" Male NPT swivel. 100PB358 - 1/2"ID strip wound hose with Model 4 male plug x 1/2" (F) SAE (gas flare) swivel fitting. 5 psi max. 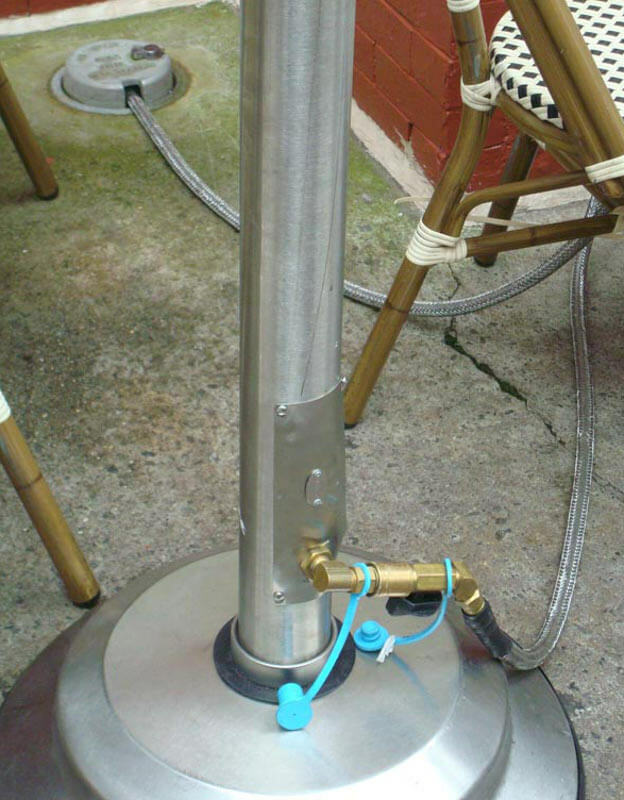 This natural gas hose can also be used with low pressure propane. Other custom made lengths available by request. Requires optional socket below. Remember that hose sizes are NOT measured by the outside diameter of the hose. For Custom length 1/2"ID low pressure (natural gas or propane) hoses call. 713.222.0077. 8 ft. 2 # 13 oz. 12 ft. 3 # 11 oz. 15 ft. 4 # 9 oz. 20 ft. 6 # 0 oz. 100PB450 - 1/2"ID strip wound hose with Model 4 male plug x 1/2" (F) SAE (gas flare) swivel fitting, with stainless steel overbraid and high temperature poly-jacketing, 60 psi max. Natural Gas Appliance Hose 1/2"ID 6' , 12', or 15' lengths. This natural gas hose can also be used with low pressure propane. This is the highest quality low pressure gas hose available. Other custom made lengths available upon request. This Stainess Steel overbraid gas hose is almost squirrel-proof. Requires optional 1/2" female socket below. Remember that hose sizes are NOT measured by the outside diameter of the hose. Free shipping to the 48 contiguous U.S. States. 104PC088 - Model 4 - 1/2"ID Quick Disconnect Female Socket x 1/2" FNPT. .5 PSI Max. Can also be used with low pressure propane. Weight 11.4oz. 104PC023 - Model 4 - 1/2"ID Quick Disconnect Ball Valve Female Socket x 1/2" (F) NPT. 25 psi max. Can also be used with low pressure propane. Ergonomically designed handle for easy on and off. Superior quality Apollo shut-off valve for a smooth open and close operation. Automatic shut-off when plug on gas hose is removed from socket. Internal thermal safety shut-off device stops the gas flow when temperatures exceed 240 °F. Can also be used with low pressure propane. Weight 1# 7oz. 4QDDP - Dust Plug for 1/2"ID Model 4 Quick Disconnect Sockets. The outside diameter of the plug insert is approx 3/4". Colors of the dust plug may vary. If you are purchasing a QD socket listed above, there is no need to purchase a Dust Plug since one is already included and will be shipped with the order. These Dust Plugs do NOT fit the Quick Disconnects on RVs. 401PC506 - Model 4 - 1/2"ID Quick Disconnect Male Plug x 1/2" (F) NPT. Weight 3.2oz. Free shipping to 48 contiguous U.S. States. 4QDDC - Model 4 Dust Cap for 1/2" ID Quick Disconnect Plug. The inside diameter of the cap cover is approx 3/4". Colors of the dust cap may vary. If you are purchasing a hose or QD plug listed above, there is no need to purchase a Dust Cap since one is already included and will be shipped with the order. These Dust Caps do NOT fit the Quick Disconnects on RVs. 48-8D - 1/2" Male SAE Gas Flare x 1/2" Male NPT Adapter. Wt.1.7 oz. Free shipping to the 48 contiguous U.S. States. 46-8D - 1/2" Male SAE Gas Flare x 1/2" Female NPT Adapter. Weight: 1.5 oz. Free shipping to the 48 contiguous U.S. States. Model 5 plug x 3/4" MNPT, 5 PSI Max. This 3/4" ID natural gas hose can also be used with low pressure propane. This is the highest quality low pressure gas hose available. Other custom made lengths are available upon request. 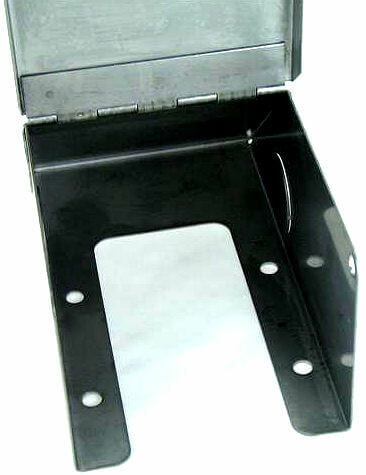 Requires optional 3/4" ID Female socket below (104089). For Custom length 3/4"ID low pressure (natural gas or propane) hoses call. 713.222.0077. 2 ft. 1 # 8 oz. Fast Free shipping to the 48 contiguous U.S. States. 100PB607 - Strip wound hose 3/4"ID x 2', 6', 10', 15', 20' or 25' lengths, Model 5 plug x 3/4" MNPT, with a stainless steel overbraid and high temperature poly-jacketing, 60 psi max. This 3/4" ID natural gas hose can also be used with low pressure propane. This is the highest quality low pressure gas hose available. Other custom made lengths are available upon request. Our stainless steel overbraid gas hose is almost squirrel-proof gas hose. 6 ft. 3 # 8 oz. 10 ft. 5 # 8 oz. 15 ft 7 # 8 oz. 20 ft 10 # 8 oz. 104PC089 - Model 5 - 3/4"ID Quick Disconnect Female Socket x 3/4" FNPT. 0.5 psi max. 104PC090 - Model 5 - 3/4" ID Quick Disconnect Ball Valve Female Socket. Can also be used with low pressure propane. Weight 1# 11oz. 5QDDP - Dust Plug for 3/4" ID Model 5 Quick Disconnect Female Socket. The outside diameter of the plug insert is approx 1". Colors of the dust plug may vary. If you are purchasing a Model 5 QD 3/4"ID socket listed above, there is no need to purchase a dust plug since one is already included and will be shipped with the order. These Dust Plugs do NOT fit the Quick connects on RVs. 401PC606 - Model 5 - 3/4" ID Quick Disconnect Male Plug x 3/4" (F) NPT. Wt. 5.6oz. Free shipping to the 48 contiguous U.S. States. 5QDDC - Dust Cap for 3/4" ID Model 5 Quick Disconnect Plug. The inside diameter of the cap cover is approx 1". Colors of the dust cap may vary. If you are purchasing a hose or QD plug listed above, there is no need to purchase a Dust Cap since one is already included and will be shipped with the order. 100PB518 - Natural Gas Appliance Hose 3/4" ID x custom length x 3/4" (M) NPT swivel fittings on each end, 5 psi max. This natural gas hose can also be used with low pressure propane. Other custom made lengths available by request. Minimum hose length is 16". Free shipping to the 48 contiguous U.S. States. 100PB612 - Natural Gas Appliance Hose 3/4" ID x custom length with Stainless Steel Overbraid and high-temperature poly-jacketing, with 3/4" (M) NPT swivel fittings on each end. 60 psi max. This natural gas hose can also be used with low pressure propane. This is the highest quality low pressure gas hose available. Get the stainless steel overbraid to beat the squirrels and other gnawing rodents. Other custom made lengths available by request. Minimum hose length is 16". 100PB519 - Natural Gas Appliance Hose 1" ID x custom length, with 1" (M) NPT fixed x 1(M) NPT swivel fittings. 5 psi max. This natural gas hose can also be used with low pressure propane. Other custom made lengths available by request. Minimum hose length is 24". Free shipping to the 48 contiguous U.S. States. 100PB622 - Natural Gas Appliance Hose 1" ID x custom length with Stainless Steel Overbraid and high-temperature poly-jacketing, and with 1" ID (M) NPT fixed and 1" ID (M) NPT swivel fittings. 60 psi max. 100PB520 - Natural Gas Appliance Hose 1 1/4" ID x custom length with 1 1/4" (M) NPT fixed x 1 1/4" (M) NPT swivel fittings. 5 psi max. 100623 - Natural Gas Appliance Hose 1 1/4" ID x custom length with Stainless Steel Overbraid and high-temperature poly-jacketing, and with 1 1/4" (M) NPT fixed x 1 1/4" (M) NPT swivel fittings. 60 psi max. This natural gas hose can also be used with low pressure propane. This is the highest quality low pressure gas hose available and is almost squirrel-proof gas hose. Custom made lengths available by request. Minimum hose length is 24". 100PB521 - Natural Gas Appliance Hose 1 1/2" ID x custom length with 1 1/2" (M) NPT fixed x 1 1/2" (M) NPT swivel fittings. 5 psi max. This natural gas hose can also be used with low pressure propane. Other custom made lengths available by request. Minimum hose length is 24". 100PB624 - Natural Gas Appliance Hose 1 1/2" ID x custom length with Stainless Steel Overbraid and high temperature poly-jacketing , with 1 1/2" fixed (M) NPT x 1 1/2" swivel (M) NPT fittings. 60 psi max. This natural gas hose can also be used with low pressure propane. This is the highest quality low pressure gas hose available and is almost squirrel-proof gas hose. Custom made lengths available by request. Minimum hose length is 24". Free shipping to the 48 contiguous U.S. States. 100PB522 - Natural Gas Appliance Hose 2" ID x custom length and 2" fixed (M) NPT x 2" swivel (M) NPT fittings. 5 psi max. 100PB615 - Natural Gas Appliance Hose 2" ID x custom length with Stainless Steel Overbraid and high temperature poly-jacketing and with 2" fixed (M) NPT x 2" swivel (M) NPT fittings. 60 psi max. CustomPipeBurners.com maintains a large inventory of M.B. Sturgis natural gas/low pressure propane hoses from 3/8" ID to 2" ID. Hoses are stocked in traditional strip-wound and stainless-steel-overbraid models in many lengths. Hoses are shipped freight-free to Florida, Georgia, New York, New Jersey - all the 48 contiguous U.S. States. We have a large inventory of quick disconnect fittings. We will send you the length of gas hose that you need.